On or about Oct. 11, 1777, Mansfield Justice of the Peace Constant Southworth signed his name to several pieces of paper money which would become, therefore, worth either four or five pence. Since these were small, somewhat crudely printed pieces of currency, they might have been lost or kept hidden away in some attic, but for collectors who specialize in paper money. 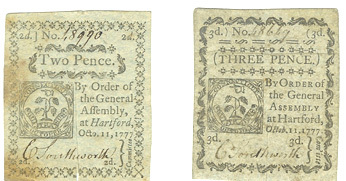 Mansfield resident C. J. , for instance, has in his collection of paper money examples of two-pence and a three-pence note signed by Southworth, who was involved in the state politics of his very important day. It was considered a great honor to sign money for one�s town in the days of the Revolutionary War. Much later, during the 1800�s, private banks issued paper money under charter to the state. In Windham Center in 1860, for instance, the Windham Bank issued $2 bills upon which are featured the town�s legend of the �Battle of the Frogs,� by having engraved in the right hand corner a figure of a live frog squatting over a dead one. This is an example of a $5 note of 1866 of the Windham National Bank. In 1879, the Windham Bank moved to Willimantic and became known as the Windham National Bank. With the coming of national currency, it issued notes charter-numbered 1614 and could no longer put frogs on its currency. of 1905 of the Windham National Bank. A small size $10 note of 1929 of the Windham National Bank. In 1955, the Windham National Bank merged with the Connecticut Bank and Trust Co. The Connecticut Bank and Trust was bought by Fleet Bank of Boston, Massachusetts, which in turn was bought by Bank of America which still has an office in Willimantic. Among the bank notes of C. J.�s collection, for instance, is a $2, 1852 note of the Pequonnock Bank of Bridgeport signed by P.T. Barnum. �He was a banker before he entered the entertainment field,� says C. J.
a $1 bank note issued by the Windham County Bank of Brooklyn, Connecticut in 1823 and signed by Joseph Eaton, descendants of whom still live in the area. This is a $5 note of 1878 of the First National Bank of Willimantic. only 4 are known in collections. to this style and denomination as a "Lazy Deuce".